Marc volunteered his services to machine down our needed carbon proofs, and he suggest that to do about 100 needed pieces, perhaps it would make more sense to have a CMC capable business do it for us, based on the working piece from Mark. I enclose further below the emails that Marc and I had on this subject. 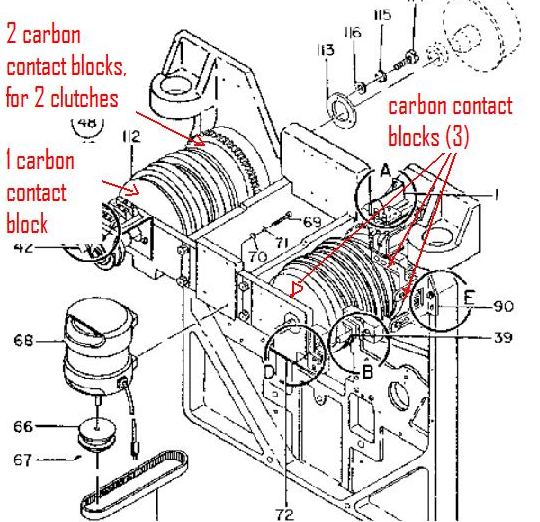 Also please reference 3 figures below, for exploded view of Bakelite holder with carbons, drawing of proposed carbon brush, and location where these are installed within the 729 tape drive. Held meeting after lunch, and continued activity in CE room. On the matter of the dimensions, Glen found in the CE room two additional brush blocks, one of them with 'brand new', unused carbons. 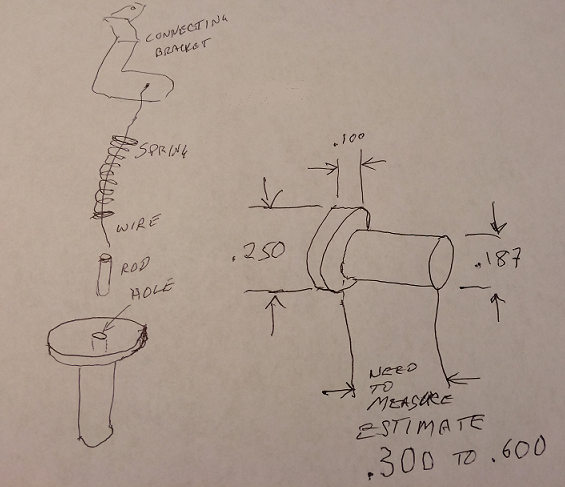 Measured these, and the dimension that we needed, the length of the .187 diameter part, the two new ones, are of different lengths ! ....one measures .375, while the other .335. I believe we should that the longer length, to make the test carbons, to see if at this length they can be inserted in the double holder between the front two clutches, where the amount of space is limited. If unable to install these, we can always cut down up to perhaps .040 and see how long it can be, and still fit. I enclose pic. below, with the new, previously unknown length, and we verified that the other dimensions are exactly right. First and easiest. 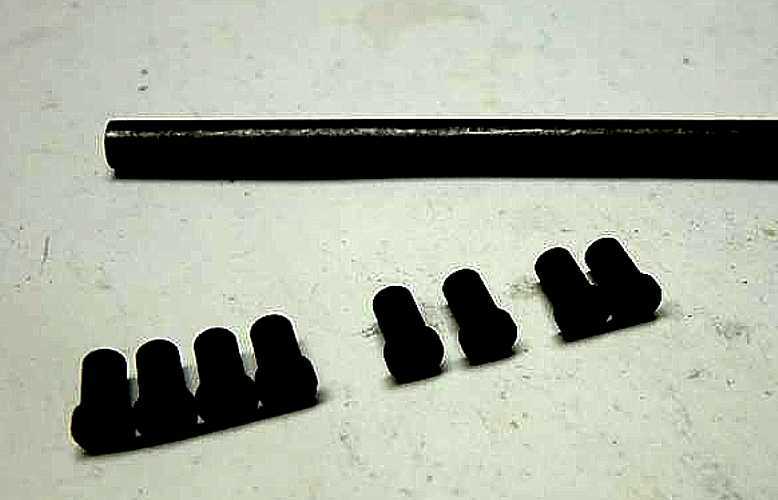 From available brush stock, square .250 carbons, use Drill press to make them .187 all the way, then cut to the .450 new total total length, then epoxy on flat plastic washer at the end where the wire comes out, the washer is available with .250 (1/4") outside diameter, and .187 (3/16) internal hole diameter. The cutting down on the drill press will be done with cutting hollow tube jig, which Stan offered to obtain, and make the first pair of test carbons for use in our 729's, possibly in our CE room. 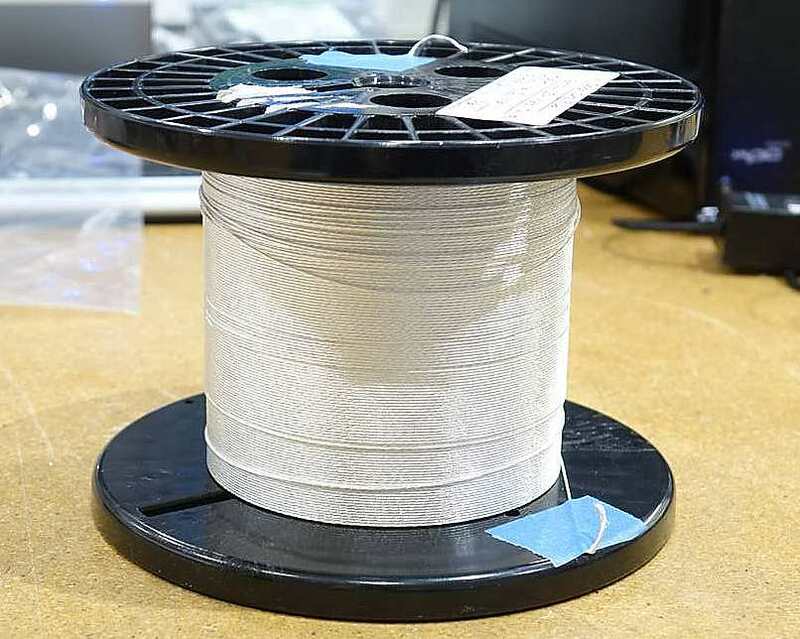 The second, medium difficulty, also involves getting brush stock of .250 with attached wire, and take two passes, with two different cutting hollow tube jigs, one 1/4" all the way through, then, the other 3/16" cut, stopping just .100 short to leave the desired larger diameter head, on the wire end. 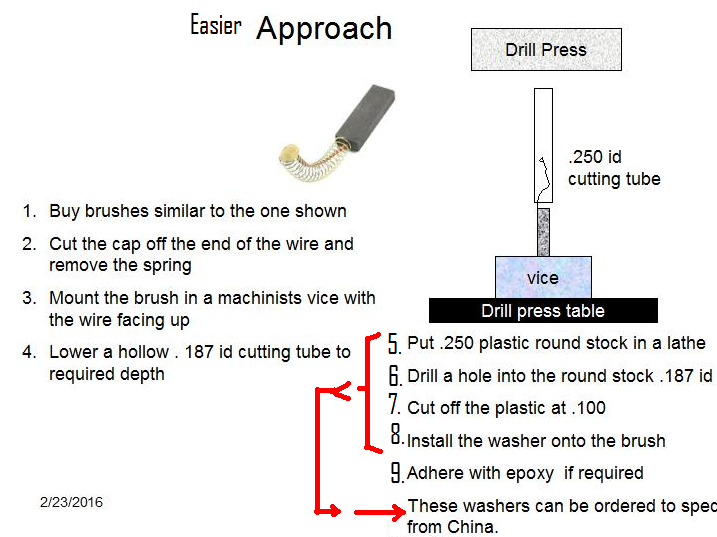 The third, is the previously described process, of using a lathe to make the required cuts and at the end, tap a hole, and attach wire with the conducting epoxy, as Marc suggested. This was thought by all to be perhaps the most precise, but also the more difficult way, because of having to deal with adding the contact wire afterwards. We will try these processes until found the easier one that works properly. The nice drawings provided by Stan, slightly modified by me, to incorporate the latest thinking of what would be easier to accomplish. Iggy has become an expert on our IBM 729 tape drives. 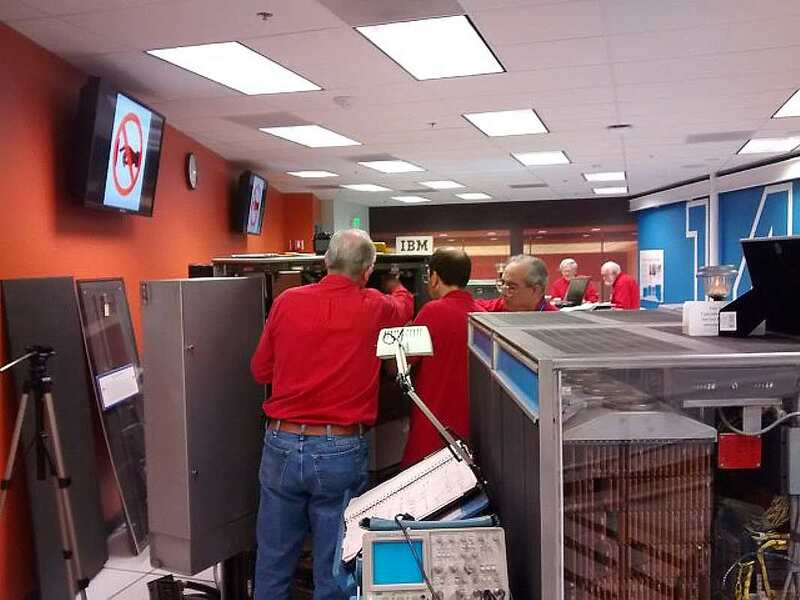 This is because the only IBM 3850 Mass Storage Systems the museum has is in a wear house on the other side of town and he is not allowed to touch it. Each IBM 729 tape drive has six magnetic clutches to control the movement of the supply and take up reels. Each clutch has a pair of electrical brushes to activate the clutch. 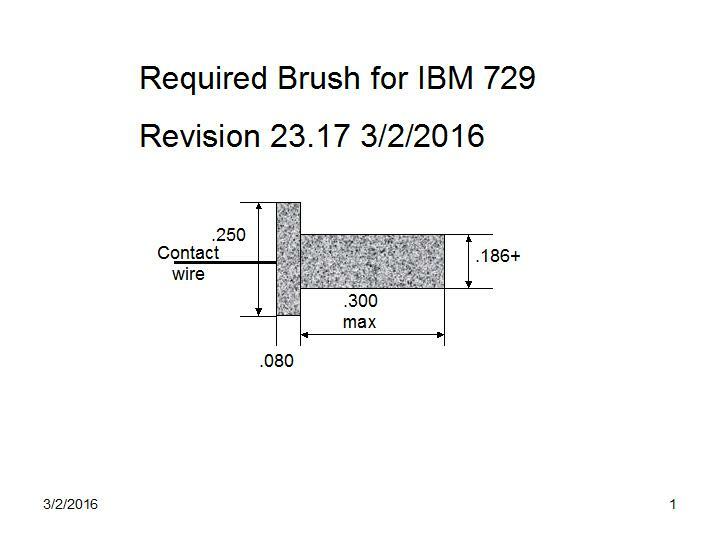 We have had problems with these brushes and IBM will not send us new brushes. The whole team (near and far) has discussed how to obtain new brushes. This has been the source of 107 e-mails and a number of meetings. Today at the CHM, the subject was brought up and various options were discussed. Iggy is the chairperson of the project and he feels a good solution has been found. 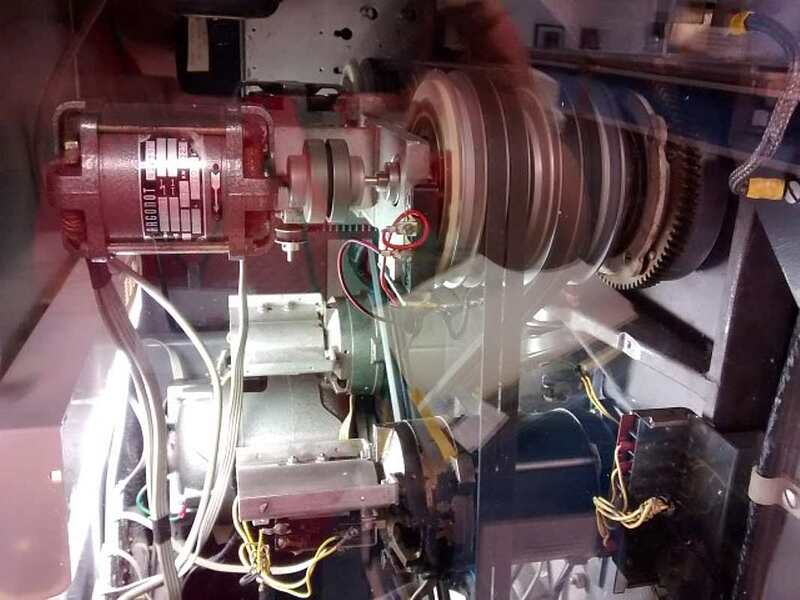 Allen Palmer sent an e-mail saying he had purchased some brushes to machine down to fit in the 729. Should be in a box someplace. 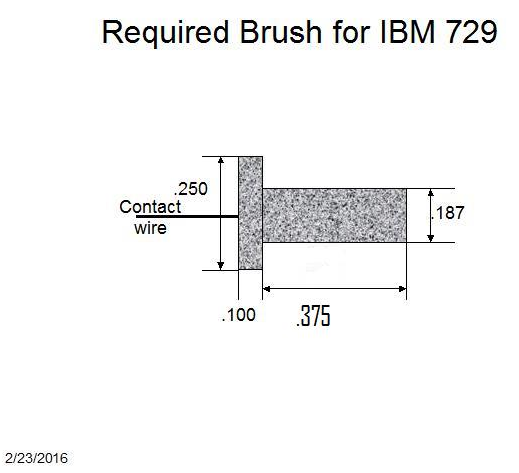 Not only did he find the raw brushes in the box, he found a virgin IBM 729 brush block with the new brushes in place. We now know the correct size of a new brush. All we have to do is make a hundred or so. Now that there is a clear picture of what is needed, there may be an easier approach to get there. There is a supplier, Helwig Carbon, which offers to press carbon brushes in any configuration. It might be a good idea to request a quote on 100 pieces, if that is the final number. If the quote comes back as something reasonable, it would surely be a lot easier than machining them all. If you Google "electric motor brushes," their site will come right up, along with others, of course. There may well be other similar sources. The round brushes I had ordered arrived today. I was able to turn them to the requested size no problem, including the 0.1� lip. Just a bit slow because I can�t hold them by much, so I have to take little itsy bitsy cuts. I could do 10 a night about. They are something like $3.50 a pop. I made two that we can try tomorrow. Original on top, turned to size and shape on the bottom. Marc installed in a mounting block his two new machined carbon contacts, then installed in the German tape #3 right reel shaft, rearmost mag clutch, tested, and ran perfect ! WAY TO GO MARC ! Mark had to shorten the .186 diameter part to .330 in order for mounting block to fit in the space between its bracket and the contact rings.... Attached is the latest revision from Marc on the brush. Mark took 8 brush holders with him. to machine and install 16 more carbons in his shop. Also, we have pending the estimate for 100 ready made from a brush shop, that Dave Bennet is contacting for us. With this tool we can make an easier and correct installation of the set of brushes that go on the two front clutches that face each other. THANKS STAN ! The pure graphite rods have arrived (preferred material for slip rings). As expected, it�s the cheapest (by far) and fastest way to make them. Made 8 brushes in short order. But now I have to solve the next step, attaching the wire (the big problem right now is sourcing the wire). More to follow. I tried to machine the square brushes, and as expected this is the worst idea: it chips or goes out of chuck alignment way too easily, and they are too far from final size to make it a time efficient process. I tried to machine some more round brushes at a pace that would be suitable for 100 parts production. I failed twice on just one step, bringing them to length quickly. Either could not hold them tight enough, or I would break the small holding tail. If I can find a good process for that step, it could be a good middle way. I�ll order a few more for trial. Quotation is valid for 30 days. Helwig Carbon Products, Inc.
proudly manufactured entirely in the U.S.A.
Dave, I talked to Robert. Robert told me that you can order the brushes, the amount is fine. After some delivery delays in UPS and on our end, the new brushes are now in the 1401 Work Room. his signature on it ;-) . 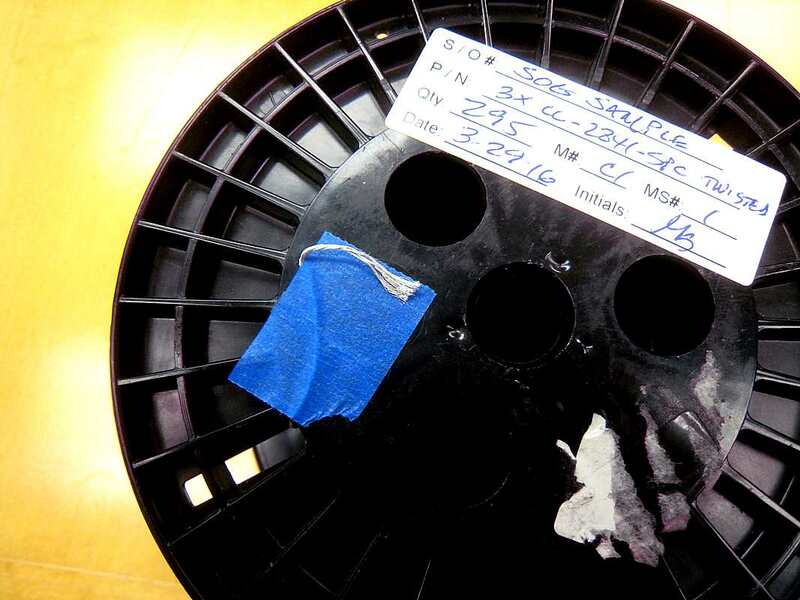 This is the side of the reel. 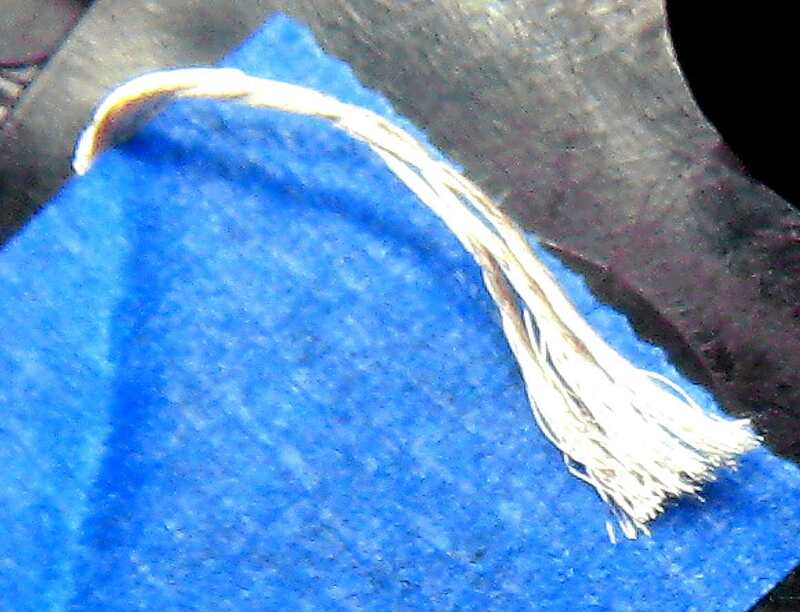 and the silver plated strands of really thin wire. Iggy Menendez opens the box which has had so many adventures. electromagnetic clutches just like ours to operate the RAMAC arm. And the mandatory warning - Iggy and I agreed we should have died horrible deaths many years ago. A quick review  of the IBM 729 electromagnetic clutches. the loose powder becomes solid, coupling the two plates of the clutch. 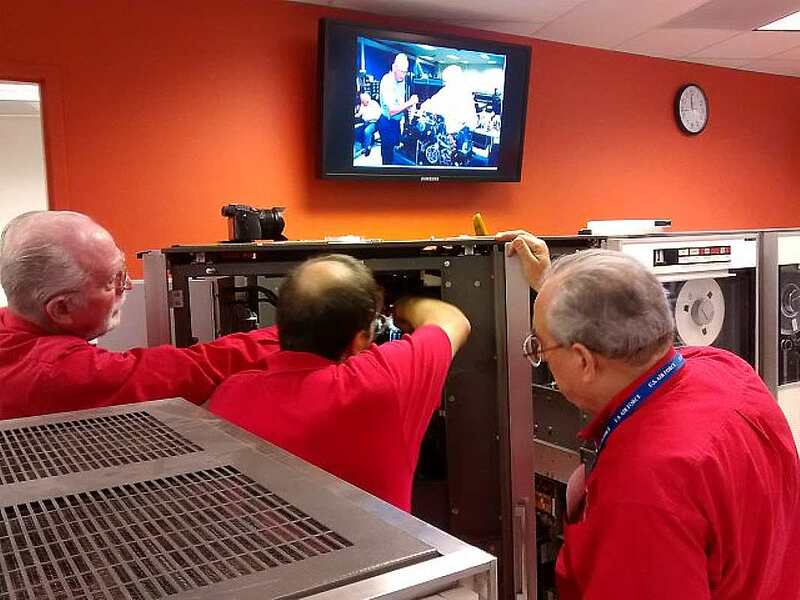 how to bring the tape drives up to reliable operating condition. in part because the working parts are hidden and of unknown condition and wear. 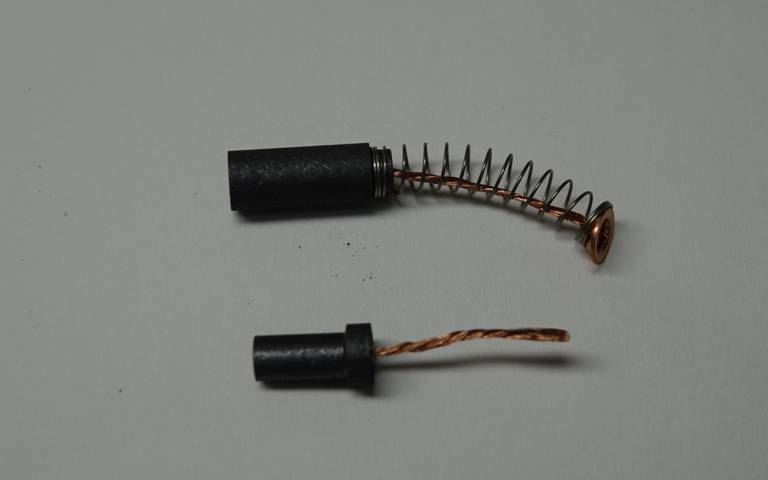 To get the electric current into the rotating clutch, carbon brushes are used. This is quite similar to the use of carbon brushes in generators and motors. 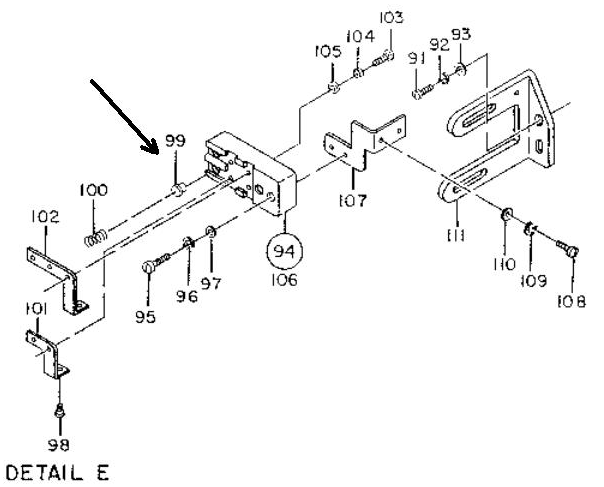 to check visually for sufficient length until the next periodic inspection. so we can check for sufficient reserve length. opaque plastic material (seems to be "Bakelite"). The previous is best case, this is a worse case. Two clutches are 13/16 inches apart. the brushes to protrude to make contact with the slip rings. which is very easy to install from the outside of the tape drive...."
two clutches closest to the reel of tape. difficult to secure, attach wires and cap, etc. The new brush has a long wire pig tail makes for easier handling and soldering. Here an almost restored brush block. The last step is to solder the copper "pig tail"
for proper solder flow. Someone will bring their robust soldering "iron"   on Wednesday. into the 13/16 inch gap and get them all lined up on the slip rings ?? and not slipping into the center opening of the clutch assembly. This is difficult under ideal conditions on a work bench. so we can see and constrain the brushes. from the 729 unit will deserve a "Hero Medal". with the aid of Frank's [King] 'cattle prod' soldering iron (good and large enough to brand horses !). and thanked him for his effort in procuring these brushes in such timely fashion. difficult connection to the wires that Marc labeled "a piece of cake"
contact rings, so the cards compressed the carbons on its tensioning springs. With much difficulty the bracket was secured on the frame casting, aligned, and tightened. Then Marc exclaimed "a piece of cake!" (as my jaw hit the floor in astonishment!). "small cables," Glen finally got them all connected. Powered up and tested load/unload/high-speed-rewind, all OK, and NO SPARKS now. causing the myriad of read errors. High-fives, kudos, accolades, and applause for all involved in this 3 hour surgical procedure!! left vac. column, and loaded good on the right col. AND HUNG ! and now it would load OK on the left col., but would not load on the right col.
After adjustment of both stop capstans. 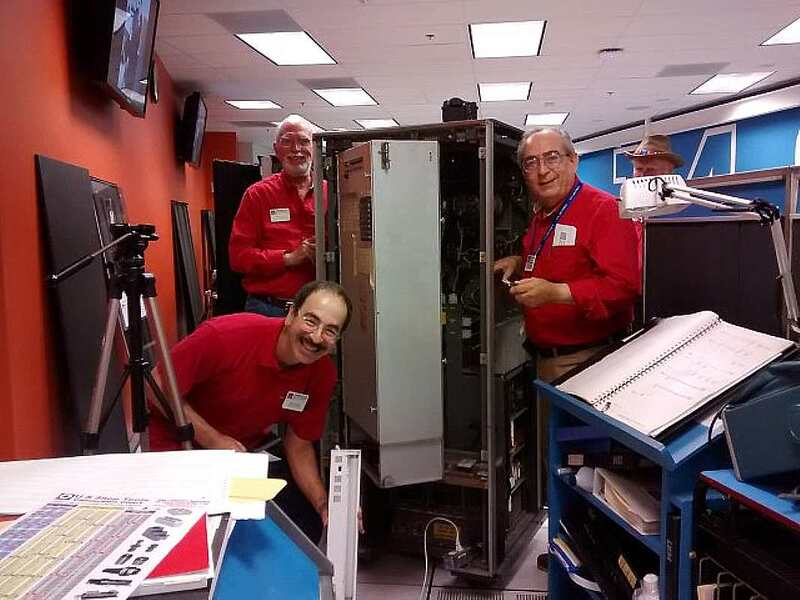 Load/unload works OK.
At time of demo, all SEVEN drives working OK (#3 drive in Conn.Sys ok only for demo as Docents know). (BTW, visual inspection gave us the count of FIVE new style brush (adjustable) brackets, and two 'old style pain in the neck' ones. Glen, Marc, Stan, and Iggy.